Home › FAQ › Why Is There a November 1st Deadline for Applying to College? Why Is There a November 1st Deadline for Applying to College? Applying to your school of choice is difficult enough without worrying about missing the deadline, but you might wonder why there’s a November 1st deadline for applying to college when school won’t start again until the next fall. Schools set different application deadlines for a few reasons, including processing time and financial aid acceptance. Depending on the program you’re applying to and your status as a first-time, transfer or non-traditional student, you might have different application deadlines than your fellow classmates. In general, however, most schools offer a Nov. 1 deadline for students who are applying as “early action” or “early decision” candidates. When you apply to a university during your senior year of high school, you have until the first of January for regular admissions. Once you apply, you’ll typically hear a decision by April. Students who want to know sooner than this can apply early, most often by Nov. 1, and may hear back in January or February about whether they’ve been accepted. According to College Board, about 450 schools throughout the country allow students to apply as early action or early decision candidates. There’s a key difference between the two application types. Early decision applicants can’t change their minds without risking the possibility of being blacklisted from other colleges. In other words, if you promise to attend a specific school and get accepted, but you don’t follow through, then other schools may not accept you either. Early action applicants, on the other hand, don’t have to commit to the college up front. If you apply early without committing to the school, then you can decline the acceptance letter if another school better meets your needs. If you choose to apply as an early action or early decision candidate, then do your homework before submitting your final application. Many students submit an early application, because they think it’ll eliminate one source of stress, but it can be stressful to submit an application before you’re really ready. Early applications are most appropriate for students who know without a doubt which school they want to attend. 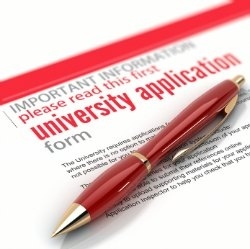 Not every student needs to or should apply to college by the first of November. If you need to improve your grades during the fall of your senior year, for example, then you should wait until the regular admissions deadline to apply. For most schools, this means Jan. 1 instead of Nov. 1. The additional two months can help you make a final decision on which schools to consider, saving you from a last-minute rush to get in all of your documents. U.S. News and World Report offers additional advice for choosing a deadline option that works for you. The November application deadline only applies to students who want an early decision about college. It’s helpful in making sure that your chosen school will accept you and offer you the appropriate financial aid package if you need one. However, you might not know for sure which college you want to attend, and that’s okay. The November 1st deadline for applying to college can alleviate the stress of your senior year, but you can wait until the regular deadline if you’re not quite ready to commit to a school.